I dread Fridays. The anxiety can start the day before, and then the mornings find me pacing and monitoring the Internet, the local weather channel, a friend’s broadband radio and WhatsApp. On Fridays, my husband is scheduled to come back to Kathmandu from Bangladesh. It’s not that I don’t want to see him. Spending an occasional weekend together is a welcome treat. The problem is getting him here. Every week, what is in fact just an hour and ten-minute flight, a Washington D.C. to New York hop, can evolve into a several day ordeal, if it happens at all. 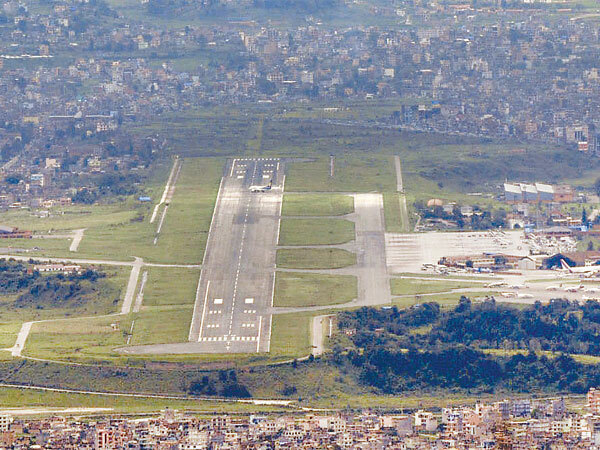 Kathmandu is a city of 3.5 million, and though air traffic cannot be compared to Delhi or Bangkok, it is not a backwater. Scores of international airlines come everyday, with heavy traffic from India, several Chinese cities, non-stop from as far as Korea and Turkey. Nepal, like Bangladesh, is a major supplier of migrant labor to the Middle East and Malaysia, and their airplanes land here as often as four times a day. If John were commuting from India, he’d have a vast array of airlines and departure times from which to choose. But my husband is based in Dhaka, Bangladesh’s capital of 12 million. It used to have two airlines plying the Kathmandu route every day but a few months ago, without giving a reason, United BD dropped down to two flights a week, leaving only the national carrier, Biman Bangladesh Airlines, offering (on paper) five flights a week. Bangladesh is the only one of Nepal’s neighbors that offers so few flights. Even Bhutan, a country of 775,000, flies daily to Kathmandu. Filling the plane does not appear to be an issue. So why is it so hard for John to get here? Nepal, a land of steep mountains, narrow valleys, unpredictable weather and few paved roads, offers 48 airports, though most are dirt strips precariously cleared on narrow mountain ledges. 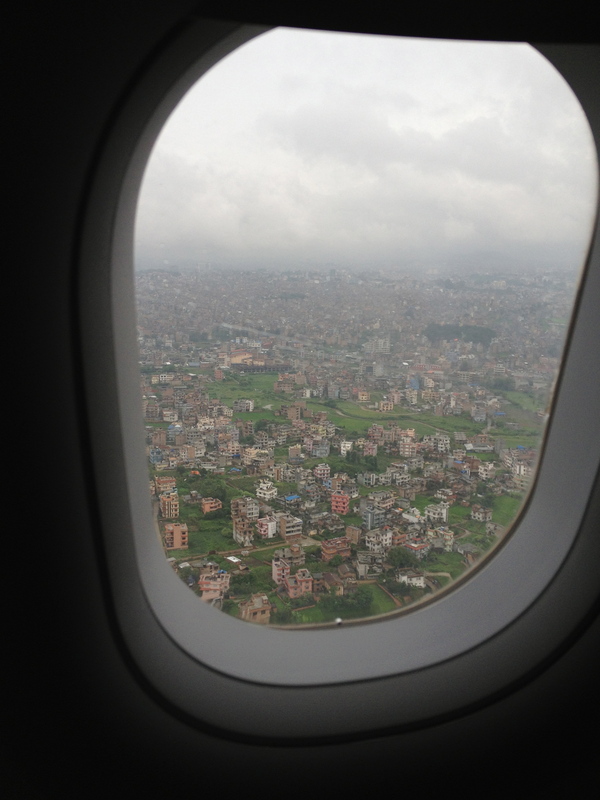 The Kathmandu valley is circled by hills (the Nepalis call anything under 4000m a ‘hill’) that require a plane to dive sharply down towards the airport. Auto-pilot is not an option here. It is required to be a visual pilot (not co-pilot) landing. The runway also has reoccurring problems, especially during the monsoon rains, when cracks widen and close the airport for hours or even a day or more. The local fauna gets in its dibs as well. Last month an earthworm infestation on the runway attracted so many birds that landings were suspended and planes diverted. Nearby garbage dumping also attracts birds that have cracked a few aircraft windshields. During the three-month long monsoon rains, thunderstorms and wind shear over Kathmandu can force planes to re-route to India and Dhaka. A Nepali friend has hooked me onto FlightRadar24, and from the comfort of my Ikea lounge chair, I can follow live-time landings and take-offs into the valley. I have spent way too much time tracking the red loops made by as many as five little planes at a time as they circle over and over and over Chitwan National Park waiting for permission to edge towards Kathmandu. Even before takeoff, Biman has challenges. State-owned, cash-strapped, with little transparency and a poorly-maintained fleet, its functioning planes get juggled from route to route. The Kathmandu route is a frequent victim. 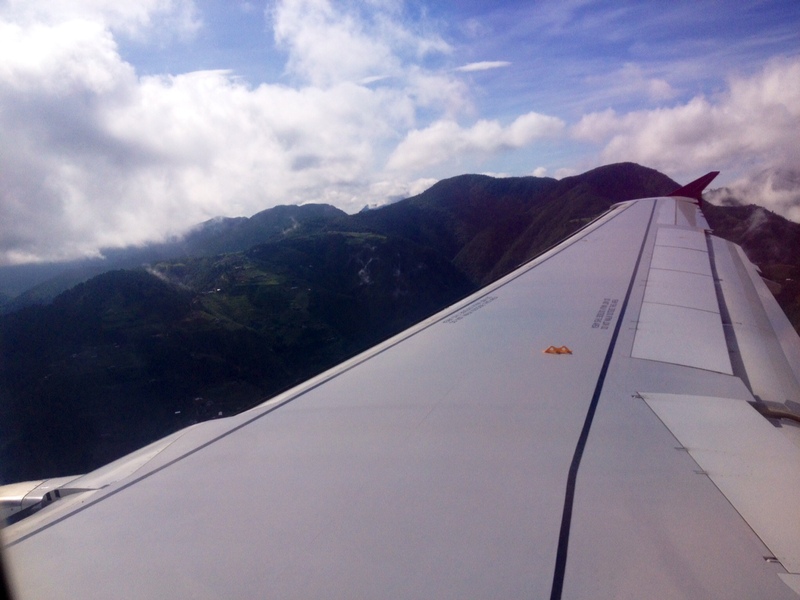 But even then, if and when you take-off, the problems are not always solved. The last week of July, the Nepal-bound flight caught fire when it blew four of its left-side tires as it landed in Kathmandu. No one was injured. Last Friday, John went to the airport for his 11:00 a.m. Biman flight (Friday is the first day of the Bangladeshi weekend). Once there he was told it had been delayed to 4:00 pm, a common occurrence. The plane then took off on time but after a half hour, an announcement was made in Bangla that the plane had technical difficulties and would have to return to Dhaka. As the plane turned around, John saw a man wearing a Biman pilot’s uniform taking out a prayer rug from the overhead bin and commencing to pray in the aisle. Perhaps for that reason the plane landed safely? Once back in Dhaka, passengers were then kept in the airport for five hours, with-half hourly promises of updates that never came, until 10:00 pm when Biman, faced by an angry plane-load of people, cancelled the flight. With Sunday a working day in Bangladesh, it didn’t make sense for John to attempt the next day’s flight. A newspaper article a few days later explained that the A310-300 S2-ADK , the sole Biman craft that flies the Kathmandu route, had had a throttle stagger, a problem with the control that maintains the speed of the plane on landing and take-off. Two days before, this same plane had an unidentified technical glitch that again forced Biman to cancel the daily flight. The acting CEO of Biman had some vague and not very proactive words to share with his airline’s clients. “I have heard of frequent problems on the Dhaka-Kathmandu route and we might have to think about the A310-300 S2-ADK,” said Mosaddique Ahmed to the Daily Star newspaper. I can hear my sister telling me: “Dony, stop being so pathetic!” In my foreign correspondent days, I flew sitting with chickens, goats, a metal bucket full of garlic- covered raw meat at my feet, standing behind the pilot during nose-dive mountain landings and sitting on bales of Khat in a propeller plane gutted of seats and flown by a pilot wearing a black bowler hat. It’s the frustration really. It means another week not seeing John. It means his having no choice but to take an unsafe airline to do his job. It’s the irony of Bangladesh. In our world of globalization, of instant communication, of apps that do everything but brush your teeth, in the world’s eighth most populated country home to brilliant novelists and poets, Nobel prize winners, world famous NGOs, the national airline can’t even maintain good connections with its neighbors. 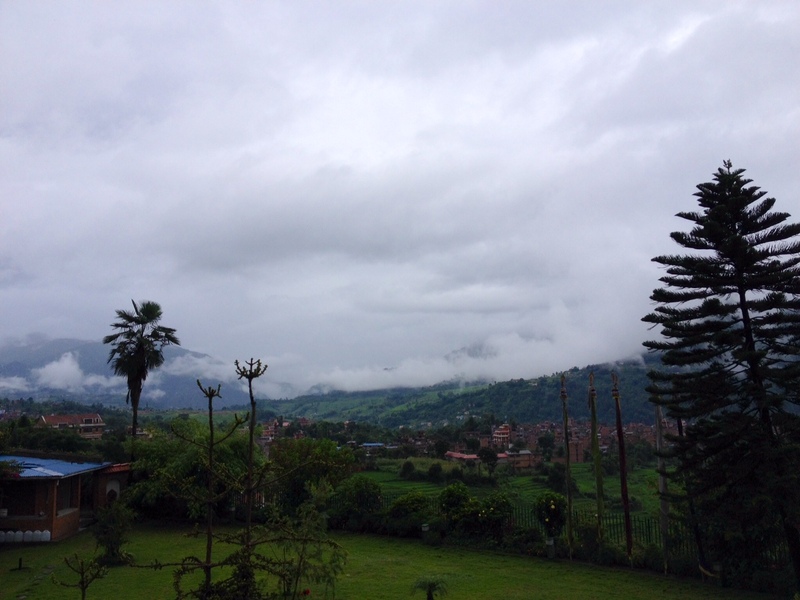 This week, heavy and constant monsoon rains have been coating the region from Bangladesh across Bhutan and Nepal, and the fog enshrouds us here in Kathmandu in a thick white veil. Our house is on the main flight path and the grumble of passing jet engines are a soothing reminder that, yes, planes are still landing. Today a Nepali friend messaged me that he’d stopped for puja (worship) at Pashupatinath, one of the world’s holiest Shiva shrines, just to get a blessing for today’s Biman flight. There were no praying pilots on board this week. The flight circled a number of times over the valley. But the flight made it. A good day for the Dhaka commute. This entry was posted in bangladesh, Biman Bangladesh Airlines, family, India, Kathmandu, living overseas, long distance relationships, Nepal, religion, Shiva, south asia, Uncategorized and tagged airlines, airplanes, aviation, bangladesh, Biman Bangladesh Airline, commuting, Donatella Lorch, economic growth, India, Kathmandu, Kathmandu Valley, living overseas, Nepal, south asia, transportation on August 15, 2014 by Donatella Lorch.